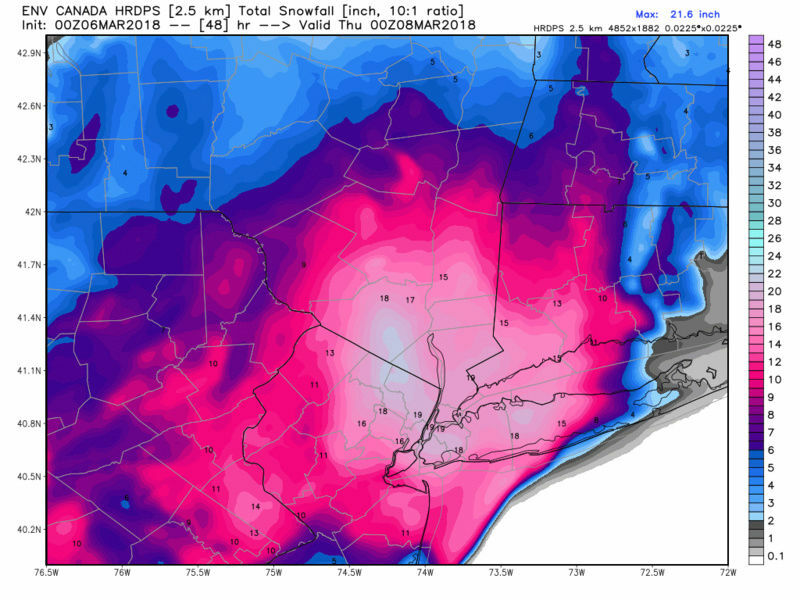 Wow, not sure what to think but the 06z runs are disheartening here in westchester. NAM now introduces rain, GFS is basically all rain with 1-3 inches, Euro is great with about 12-14, 3km is way less amped but still about 12-14 and rgem is loco 24 inches. Soul I dunno this may not be looking good for us, not sure what to think. WSW says 6-12 with 10-15 over interior hudson valley and locally higher amounts possible. Guess I should not have gotten so excited over the 00z hi-res models, or even the regular NAM. Sigh I guess we will see what 12z says, are we going even further west to where the LP tracks over land? Rb was saying he thinks more west. Warning now for up to 15 inches for dutchess county. 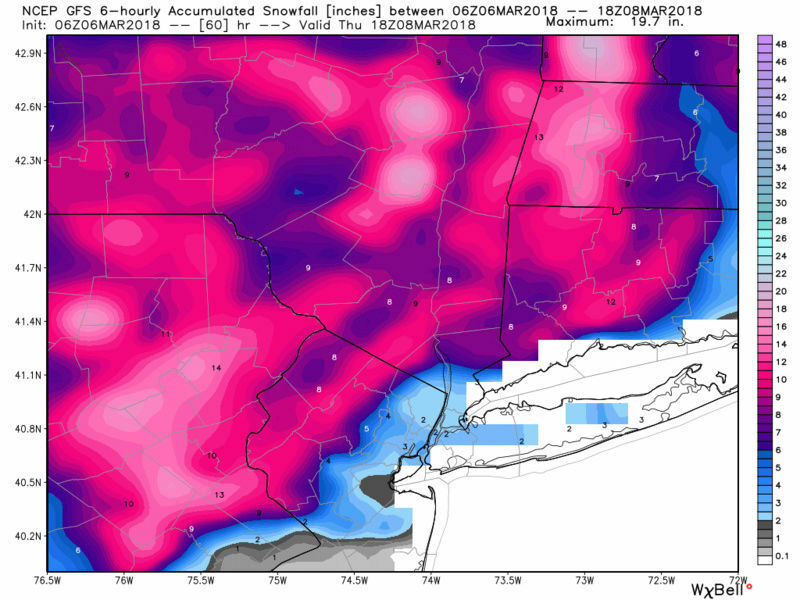 Not happy skins, as CP said Yonkers is about due but looks like this time we may again be the cutoff, WSW could be dropped if the GFS verified. Taht would be a kick to the face. No way am I writing this storm off it IS the 06z run but as I said its a bit disheartening to see the NAM trend west. jimv45 wrote: Rb was saying he thinks more west. Warning now for up to 15 inches for dutchess county. Jman it hasn't been very good up here where rb and I are this one looks to be decent but any more west we may mix as well. jmanley32 wrote: I had to wake to this so so does all the other people in the NYC area, what a aweful thing, even 00z had like 10 inches. now 2. Wow, a nail biter for sure for areas S and E.I've got elevation, 600 plus feet and more N and W but this westerly trend could even affect up here with mixing issues.Where that rain/snow line sets up early in the storm and it's movement, will tell the tale tomorrow in nowcast.Hoping for an area wide 6 to 12 event so everybody is on the board tomorrow with good news. Like Bernie says, "windshield wiper with the models". Has anyone noticed with each run it shows a tucked in solution only to kick east the next run. EPS is locked in with the EURO. That's a good model to have this close to the event. GFS is a disaster. It has a lower resolution which makes the temp thermals too warm. I'm discarding it. People need to relax. With the block in place even if the low kisses Cape May County, pattern argues for a ENE track thereafter. That's my feeling anyways. 12z should be a hoot today regardless of the outcome. Note no 4am Al posts from westchester, never a good sign. If he isn't posting that usually means its a no go. If your just busy Al my mistake. But I always wake waiting to read your posts. 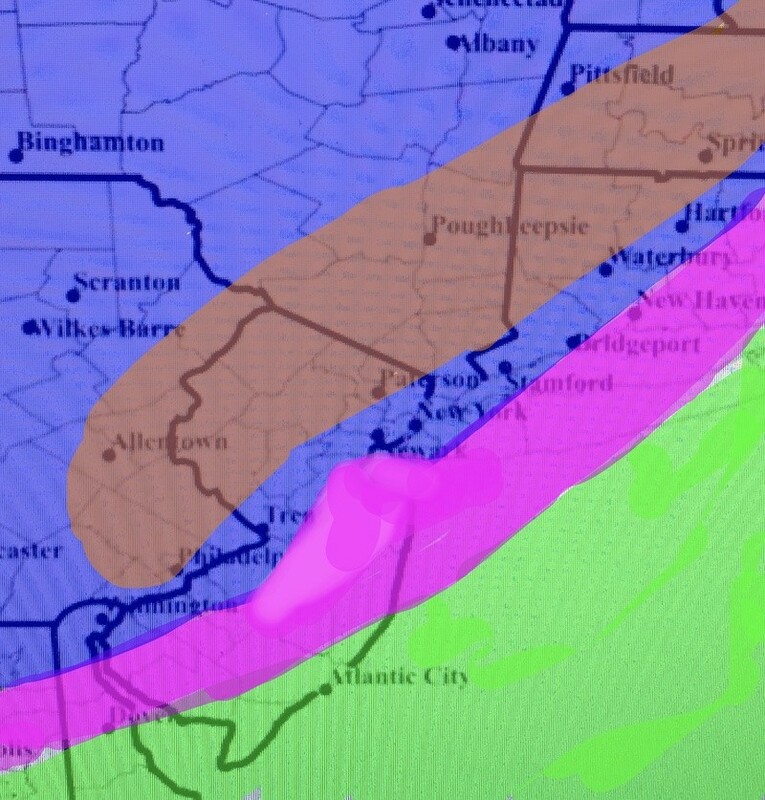 nutleyblizzard wrote: Like Bernie says, "windshield wiper with the models". Has anyone noticed with each run it shows a tucked in solution only to kick east the next run. EPS is locked in with the EURO. That's a good model to have this close to the event. GFS is a disaster. It has a lower resolution which makes the temp thermals too warm. I'm discarding it. People need to relax. With the block in place even if the low kisses Cape May County, pattern argues for a ENE track thereafter. That's my feeling anyways. 12z should be a hoot today regardless of the outcome. true but even within 18 hrs or so? billg315 wrote: I was emboldened by Syos to give this a try with limited art skills. Pardon some of the imperfections but you'll get the point. Hahaha. Yes, it should. I couldn’t find one (for some reason) that went far enough east, so figured you wouldn’t mind. lol. But credit does go to you for that. Thank you! MUUUUUUUCH BETTER!!!! Let's hope this one pans out so we can have a blast tomorrow on the board!!! I don’t understand how we can be inside if 24 hours from the start time, and I have a couple of models showing me at 14-20” and a couple of others showing rain. Doesn’t make sense. How can there be such different outcomes. Having perused the 6z runs I’d say the consensus we are always looking for is almost there (maybe not as we’d all like it). NAM and GFS are pretty close in low placement. Surface and upper air temps are pretty close. As of 6z both want to hug the coast tight and work some warm air in close to the coast. GFS definitely is more bullish on pushing the r/s line further north and west and is still not a good look for the jersey shore and east of NYC (i.e. LI). 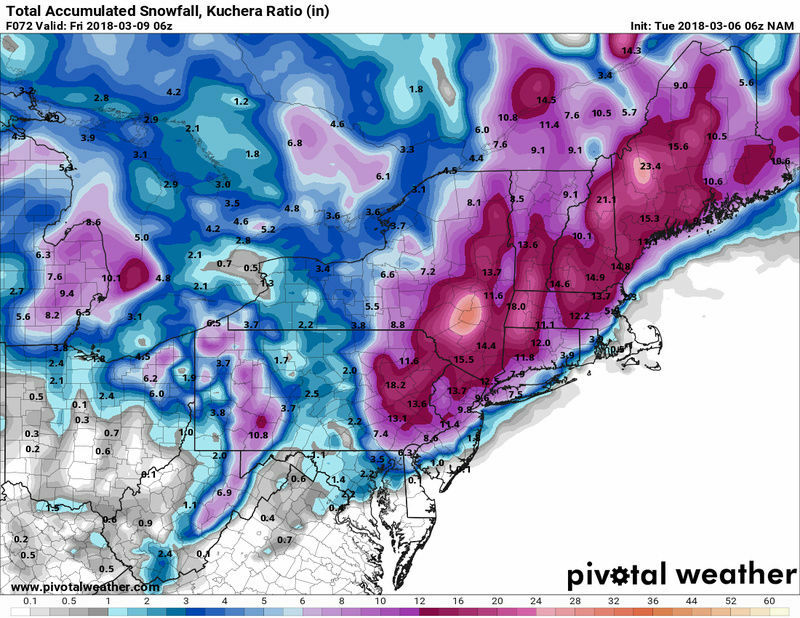 NAM sees the issue but holds the line on snow a little better. Right now I my thought is the Low will hug the coast. I think the NAM is closer on precip but gfs isn’t to be discounted. There will be mixing issues with snow/rain mid storm into NYC and central NJ (almost or maybe to my location) but once the low pulls alongside or just north it will go back to snow for most people. Since snow will be heavy most people who have mixing issues briefly will do just fine. I think LI, at least central LI east is in a bad spot for mixing with rain, but I think you may get a thump of snow at the end late Wed. Evening. If this verified in the area just west of Albany NY it would be rough even up there. They received 30-40 inches from the Friday storm another 20-30 would be rough. 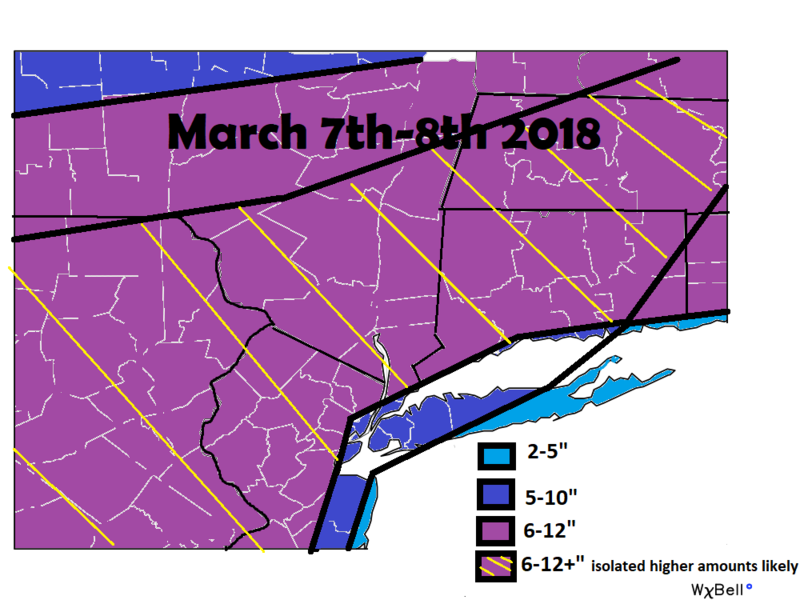 Here is my snow map. I will make a snow maps only thread so we can see everyone's snow maps in one spot. My map is based on a track as indicated. IF the track is shifted slightly N&W within my cone of uncertainty obviously the lines drawn shift accordingly. I still worry that E half of LI esp but the coastal plain in general will not have the best ratios with this storm such that despite heavy snow, accumulations still wont get to where they will just off the coastal plain. A shift to the track slight south and or east will obv bring higher totals into LI and eastern most sections as the soln would be colder. Bottom line it does appear everyone will get something. Start time will begin tonight around Midnight and get cranking as we approach daylight. My map says March 8th as well, but I doubt it lasts into Thursday which I originally thought it would. sroc4 wrote: Here is my snow map. I will make a snow maps only thread so we can see everyone's snow maps in one spot. My map is based on a track as indicated. IF the track is shifted slightly N&W within my cone of uncertainty obviously the lines drawn shift accordingly. I still worry that E half of LI esp but the coastal plain in general will not have the best ratios with this storm such that despite heavy snow, accumulations still wont get to where they will just off the coastal plain. A shift to the track slight south and or east will obv bring higher totals into LI and eastern most sections as the soln would be colder. Bottom line it does appear everyone will get something. Start time will begin tonight around Midnight and get cranking as we approach daylight. 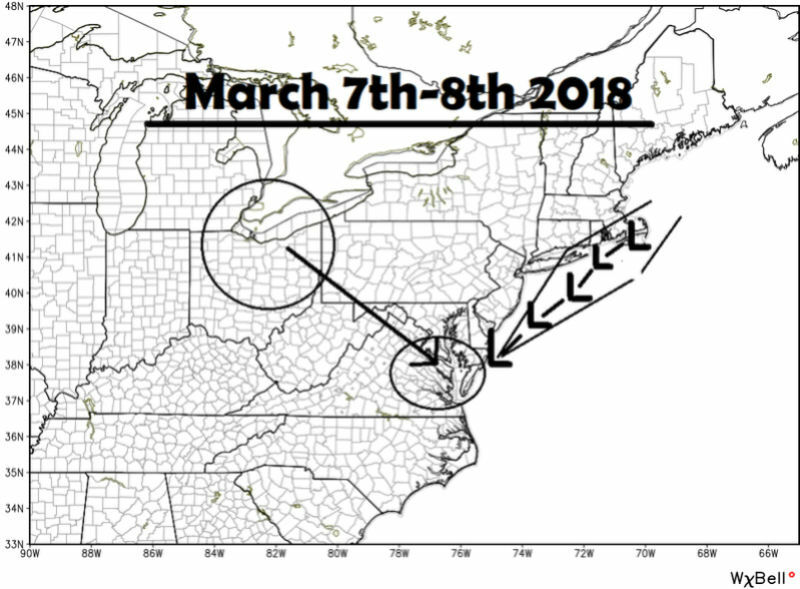 My map says March 8th as well, but I doubt it lasts into Thursday which I originally thought it would. Thanks Scott, whats the approx begin and end times for this? Good call Scott. I think this storm ticks east at 12z so I would move the amounts SE about 25 miles.